Here’s a thought for your holiday gift giving. How about gift-wrapping a bottle of organic, extra dry Jerusalem olive oil? It comes from Canaan Fair Trade, and has a fruity, flavorful blend of early harvest green peppery olive oil and late harvest sweet buttery olive oil. 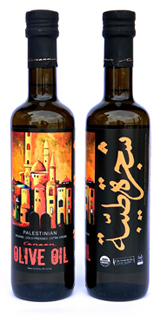 The bottle itself features a unique label with the portrait of Jerusalem by the famed Palestinian artist Ibrahim Shalaby. The cost for one 16.9 fluid ounce bottle is $23, shipping included. Our complete catalogue of books and videos is accessible using the navigation to the left. Purchases may be made on-line with a credit card. All books and videos are offered at substantial discount prices. All prices includes postage and handling.